Wood chips make me chipper. What can I say --- some women like roses, but I like mulch, even if it won't be properly aged until several months from now. We spent most of the day Saturday over at our neighbors' helping them chip the biggest pile of saplings I've ever seen. Sunday afternoon it was our turn. 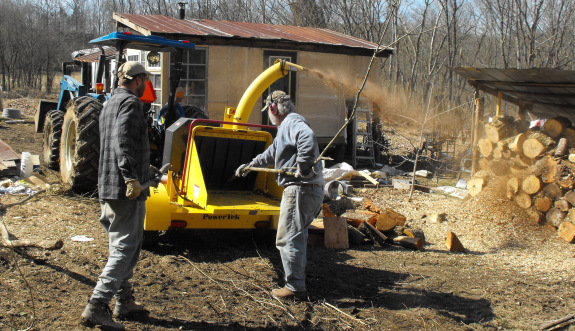 One neighbor drove the chipper over to our place with his amazingly huge tractor, and then we chipped up a storm for about four hours before giving in to exhaustion. Despite being pleased as punch about our wood chips, I have to admit that I think the chipper rental won't be an experiment we'll be repeating. Once I put on my wrist braces, my carpal tunnel simmered down, but it was still an awfully wearing weekend for about as many chips as we could get for free if we hunt down the utility line guys. Add in a few hours drive to pick up and drop off the chipper, and we might have been just as well off to buy mulch. On the other hand, we did clear up some brushy edges that needed work, and I have my wood chip piles segregated into partially decomposed (for mulching with this year), fresh pine (for mulching the blueberries next year), and fresh box-elder (for planting mushrooms in.) The control freak in me is well pleased. 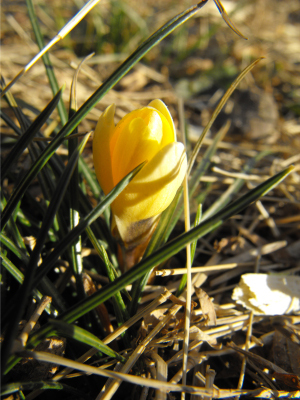 And, look, the year's first crocus!! Try a homemade chicken waterer with your new chicks and watch them grow stronger and faster. Got leftover chips? Run your car on it! A pickup would be a good choice to convert to run on wood gas. It's not for the faint of heart, though. 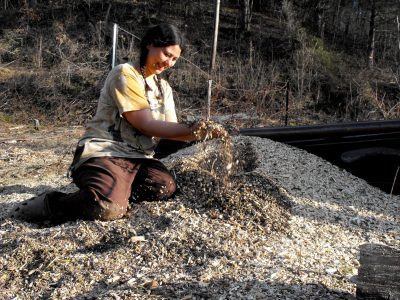 We never have leftover biomass on our farm --- I pour it all into the garden and then beg for more. I'm always intrigued by operations like that, but we'd have to have a much larger supply of wood chips for me to consider it.